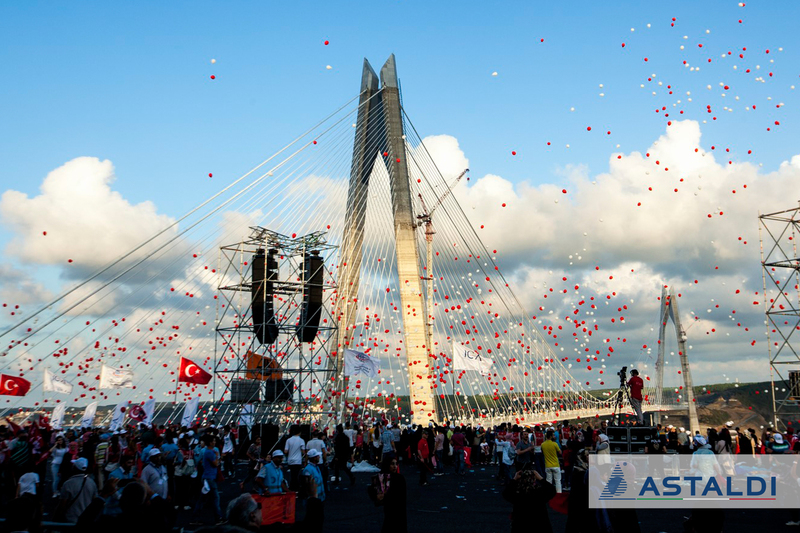 Istanbul, 25 August 2016 – The inauguration of the Third Bosphorus Bridge – the widest suspension bridge in the world with towers taller than the Eiffel Tower – will take place tomorrow in Istanbul. The hybrid cablestayed bridge is part of the project for the construction and subsequent operation under concession of 150 kilometers of the Northern Marmara Highway linking the cities of Odayeri and Paşaköy. Astaldi Group has a 33.33% interest in the joint venture ICA IC Ictas–Astaldi that was awarded the contract in 2012. The total value of the project amounts to over USD 3 billion. Starting from the inauguration, this first phase of the North Marmara Highway will become operational. Longest suspension bridge in the world whose deck features a railway line. “The Third Bosphorus Bridge is a bridge of firsts that brings the industry of professional engineering to new heights. Astaldi is proud to have played a leading role in this ground-breaking project that demanded the very best in engineering skill and advanced technology. The bridge will not only bring new growth to the region and alleviate traffic pressure within Istanbul, but it will also create a new important link between Europe and Asia” commented Paolo Astaldi, Chairman of Astaldi Group. The Bridge forms part of the Northern Marmara Highway Project, a landmark project for Astaldi Group, ranked among the world’s top 100 contractors and among the top 25 in Europe, and an established leader in Italy and abroad. The project consolidates Astaldi’s leading position in Turkey, one of Astaldi’s strongest markets, where the company has operated since the 1990s with the construction of the Anatolian Motorway. Since then, Astaldi has become one of the major players in Turkey for infrastructure works as both an EPC contractor and a concessionaire. Works on the Northern Marmara Highway Project were carried out using the BOT (“Build-Operate-Transfer”) model. The concession contract runs until 2024 (a period of ten years, two months and twenty days) and covers design and construction activities, as well as subsequent operation and maintenance of the motorway section. At the end of this period, the project will be transferred to the Ministry of Transportation. Financial closing (on a non-recourse basis for Astaldi Group) was reached in May 2014 in the form of a USD 2.3 billion loan subscribed by a syndicate of Turkish banks. The Third Bosphorus Bridge, which was delivered on time and on budget, is the second major Turkish asset that Astaldi has made operational in quick succession after it completed the construction of the Izmit Bay Bridge (in April 2016) as part of the project for the construction and operation under concession of the Gebze- Orhangazi-Izmir Motorway. Astaldi has achieved a solid return on both projects and the bridges are now open to traffic and incomegenerating with guaranteed hard currency (USD) income flows and no volume risk. Other major past works that Astaldi has completed in the country include a significant section of the Anatolian Motorway (116 kilometers between Gumusova and Gerede), the Istanbul underground (26 kilometers with 16 stations, inaugurated in August 2012), the Milas-Bodrum International Airport (constructed in just 15 months and operated through October 2015), and Istanbul’s Halie Bridge. At present, the Group is also engaged in the completion under concession of the Etlik Integrated Health Campus in Ankara, one of the largest healthcare complexes under construction in Europe.